A low angle smoothing plane has three key uses. It is used to smooth surfaces, preferably taking a diagonal cut, partly across and partly along the grain. 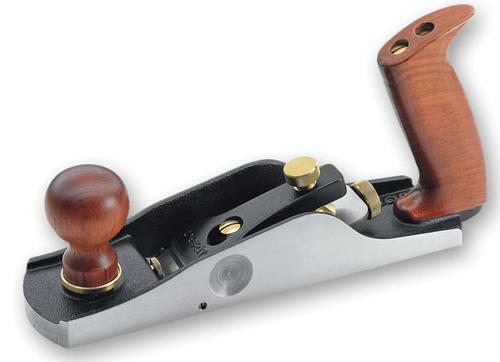 With its generous side wings, it is ideal for shooting mitres and great for end-grain work. The low cutting angle of 37° minimises fibre tearing. With a bed angle of 12°, this is a bevel-up plane like a low angle block plane. It features an adjustable mouth with a unique stop-screw, a combined feed and lateral adjustment knob for blade setting, and a generous Bubinga front knob and rear handle. The ductile cast iron body is 254 x 63mm(10" X 2.1/2"). Overall weight is just over 1.1kg(3.1/2 lb.). The supplied 25° bevel blade is 50mm(2") wide by 3.2mm(1/8") thick. The lapped blade has a flatness tolerance of ±0.005mm or better over the working surface, and with an average roughness surface finish of 0.000127mm(5 micro inches) or better.